Avoiding the crowds in Yosemite National Park is easy, even during peak season in June, July and August. Yosemite is big – over 1,000 square miles – yet most tourists flock to a handful of famous sights in Yosemite Valley. Visit those popular sights at the wrong time and you’ll encounter big crowds. Visit those sights at the right time and you’ll have a great experience. It’s easy to find peace and solitude in Yosemite. You just need to know the best times to go, the best activities and the best places to get away from crowds. Yosemite’s peak season lies between Memorial Day and Labor Day. If you visit outside the popular summer months you’ll likely avoid the crowds, even at famous sights. Fall, winter and spring are all great times to visit Yosemite. Spring (April, May, June) is one of the best times to visit Yosemite Valley because the crowds are low and the waterfalls are at their peak. Fall (September, October, November) has great temperatures and nice foliage in Yosemite Valley. Winter (December, January, February, March) is beautiful and peaceful in Yosemite, and there’s skiing at Badger Pass and natural spectacles like the natural Firefall at Horsetail Fall. 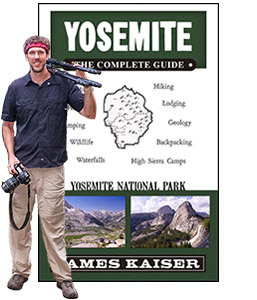 Of course, some people can only visit Yosemite National Park in June, July and August. 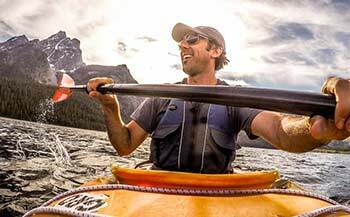 The good news: There are still plenty of great ways to avoid the crowds in the summer! Hiking is one of the best ways to avoid the crowds in Yosemite. 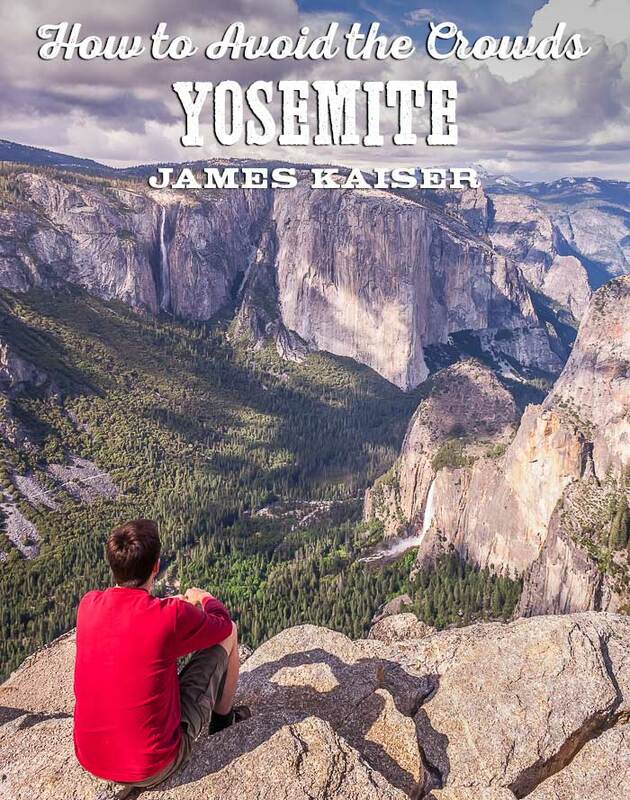 Most visitors experience Yosemite from the comfort of their car. If you’re looking to get away from the crowds, this is great news. Go for a hike and the crowds will thin out immediately. Choose a challenging trail and you’ll wonder where everyone went. 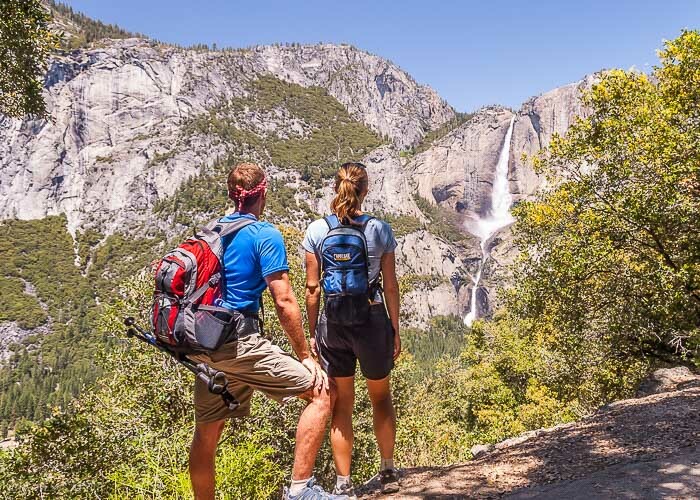 Even better, hiking trails often lead to Yosemite’s most spectacular viewpoints. Of course, there are some important exceptions to this tip. 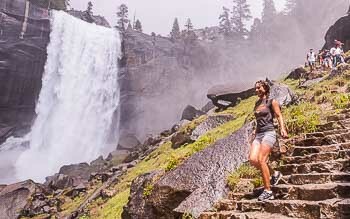 Some of the most popular trails, like the Mist Trail, are often packed with tourists. That said, you can beat the rush by hiking in the early morning. Which brings me to my next tip. Sunrise is an incredible experience in Yosemite. But most visitors, snug in their hotel rooms or tents, sleep right through it. Wake up early and you’ll avoid the crowds, even at the most popular sights. And don’t forget your camera. Early morning light is terrific for photos. You might even catch some stunning natural effects. One early morning at Glacier Point, I got beautiful shots of clouds swirling around Half Dome (above). Yosemite’s restaurants are often crowded at mealtime, resulting in long lines at places that often serve mediocre cafeteria food. Pack a picnic basket instead. It’ll save you time and frustration, and it will likely be healthier, tastier and cheaper. Best of all, you can enjoy a picnic al fresco at a beautiful viewpoint — while everyone else is waiting in line. After a long day of sightseeing, most Yosemite visitors head to bed. But night is when Mother Nature really shines. Yosemite has some of the darkest skies in California. If you’re not enjoying the stars, you’re literally missing half the show. Don’t know much about astronomy? Yosemite offers free astronomy programs led by park rangers. 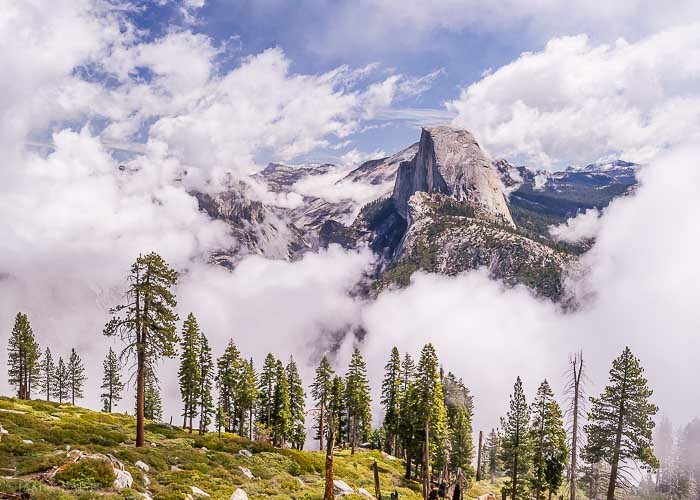 And if you visit Yosemite on a summer weekend, head straight to Glacier Point. Every Saturday night local astronomy clubs set up their telescopes at Glacier Point and share their views with the public.